When we first heard that Pandemic Studios was working on an action game based on The Lord of the Rings, we weren't just excited, we were a bit giddy. The idea seemed like a good one: Give the people who made Star Wars: Battlefront the license to create a similar game using The Lord of the Rings characters. Add to that the ability to play both sides of the epic fantasy tale and you're sure to have a winner in The Lord of the Rings: Conquest. Classes and Weapons: Conquest gives you a nice cross-section of classes to choose from. There's the straightforward warrior, the distance attack archer and mage, and the stealthy scout. Each have some pretty interesting weapons and attacks, like the ability to deliver instant-kill backstabs, heal others and drop clouds of poison into a mass of troops by arrow. They also supplement one another nicely. Graphics: The game's graphics range from mildly interesting to amazing. The graphics deliver most often while helping to capture the essence of famous battles in the story like the Battle of Osgiliath and the Mines of Moria. Heroes: Playing through the campaigns as grunts can get a little old at times. Fortunately, the game mixes things up by letting you occasionally take on the roles of heroes and larger than life creatures. Aragorn, Sauron, Balrog and Gandalf are just some of the playable heroes in the game. Split Screen Multiplayer: The Lord of the Rings: Conquest works best when it is played together with a friend in the same room. The characters are so nicely supplemental that they naturally encourage team play and make battle much more exciting. Broken Artificial Intelligence: The heavy reliance on cross-class support, means that if a mage or archer or scout doesn't have your back throughout the game, you're pretty likely to fail. Unfortunately, the game's artificial intelligence almost never does. As bad as the enemy-driven AI is, the friendly seems worse and playing without the support of the army around you often makes the single player experience an exercise in frustration. Glitchy: There are lots of little bugs that make this already wobbly game worse. Getting up after being knocked down, for instance, obligates you to roll around the ground for a second. If you're near any sort of ledge, expect to fall to your death. Riding a mount, something that could have been a highlight of the game, is unmanageable and bereft of any combat benefit. Confusing Objectives: The game uses arrows for objects. But instead of using them like GPS direction, they just sit on top of your objective pointing at the ground. In other words, if you're in a maze-like mine, it's up to you to figure out how to get to that transparent arrow. EA Online Account Required: Really EA? Really? You're really going to force me to sign up for your online service when I'm on Xbox Live to play online? You're really expecting me to use a virtual keypad to register before I can actually play a game I purchased online? Obnoxious and absurd. Trudging Single Player Experience:Even ignoring all of the faults of the single player experience — issues with AI, lack of virtual teamwork, small bugs — the single player experience still feels like what it is: A bunch of set pieces with inevitable endings. The campaign just doesn't play like a full-on single player experience. I played through half of the game on my own and it was an incredibly frustrating, tedious experience. But once I sat down with another player, the game felt a bit more fun. Too bad Electronic Arts decided to hobble the best part of the game (multiplayer) by forcing gamers to use their online service. 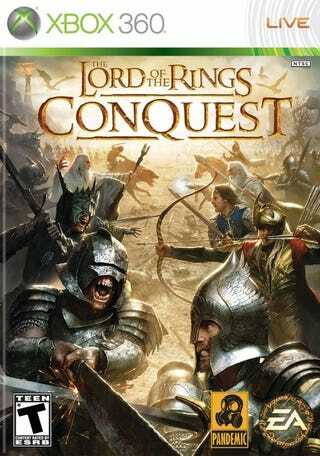 Lord of the Rings: Conquest was developed by Pandemic Studios and published by Electronic Arts, released on January 13 for DS, PC, PlayStation 3 and Xbox 360. Retails for $59.99 USD. Played through The War of the Ring campaign alone and The Rise of Sauron campaign in split screen on Xbox 360. Tested online multiplayer.